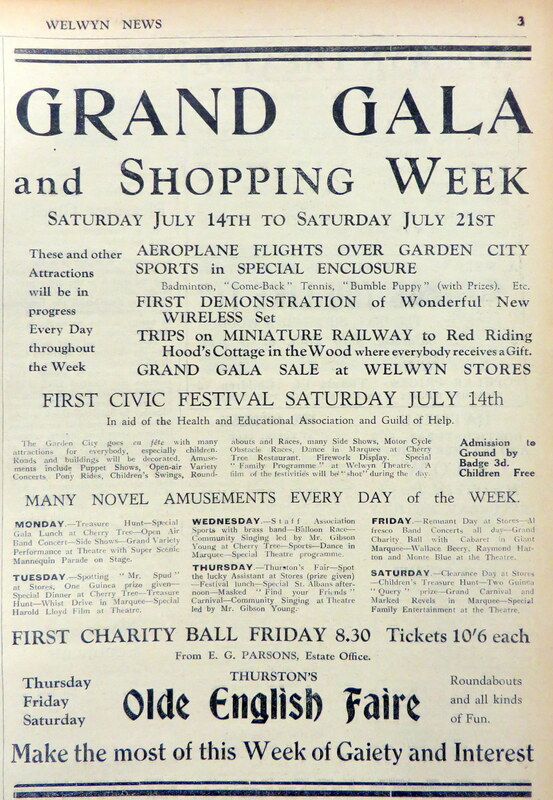 Welwyn Garden City held a Grand Gala Week during the week 14th to 21st July 1928. 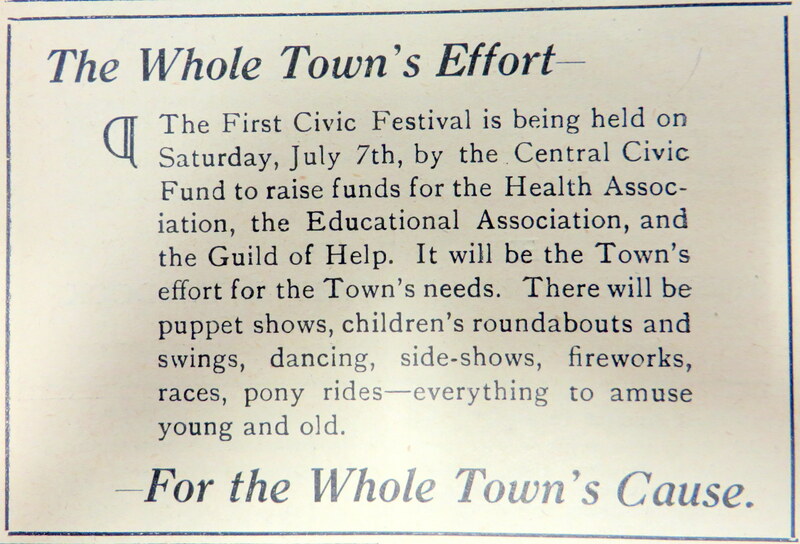 The week commenced on Saturday 14th with a First Civic Festival in aid of the Health and Educational Association and Guild of Help. 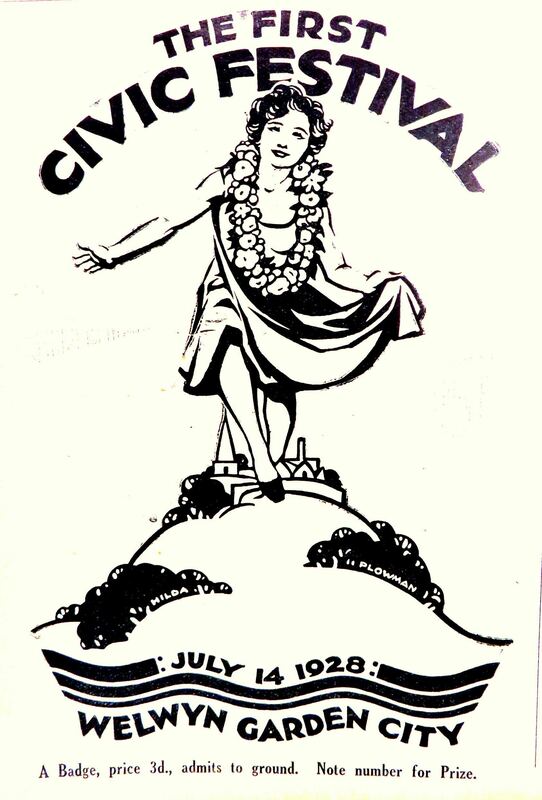 Entrance to the Festival required the purchase of a Special Numbered Badge (3d (approx. 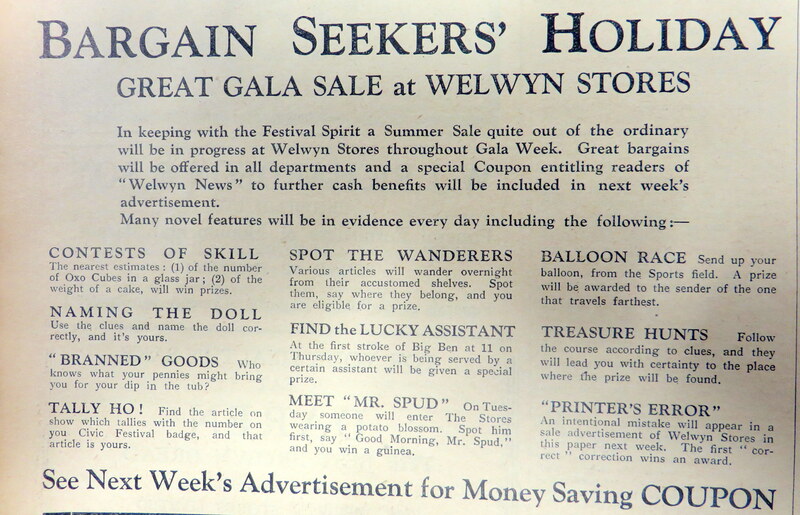 1 ½ p)), which was on sale in the streets, and the Welwyn Stores. ‘Handsome prizes’ were given to the wearers of two lucky number badges. 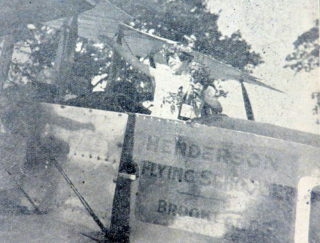 Aeroplane rides given by Col. Henderson were provided at 5/- (25p) each giving the opportunity for local residents see their homes from above. 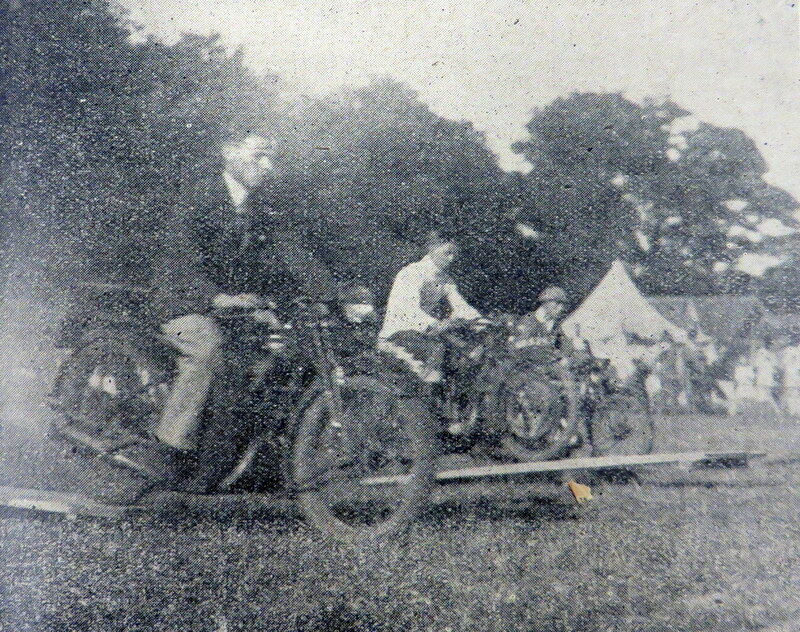 The aerodrome was at the southern end of Parkway near Barleycroft Road and was temporarily named Barleycroft Aerodrome. Miss Hurlock, a captain of Handside School, daintily arrayed as the Gala Queen in white and a head garland of red roses, christened the Festival by empting the contents of a bottle of Champagne over the side of Mr Henderson’s aeroplane (whilst on the ground) wishing prosperity to the enterprise. 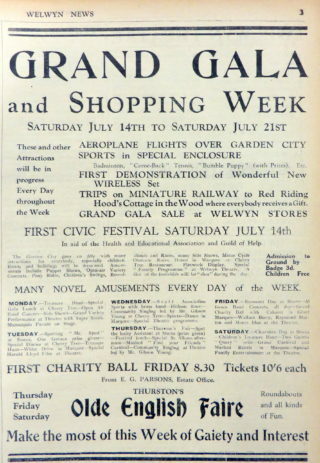 The occasion was also used to make the first aerial film of the town which was shown in the Theatre the following week. 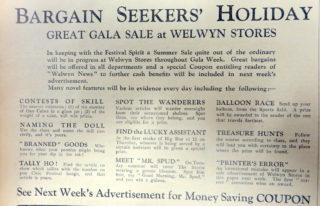 Entertainments were in an enclosure behind the Midland Bank (which is where John Lewis is today) and included Puppet Plays given by Mr. Wilkinson; Music, Dancing, and Humour which included the Polish singer Sonia Padoska; Folk Dancing together with competitions to discover the ‘Shapeliest Ankle’ and the ‘Most Attractive Smile in the Garden City’; special display of Highland, Sword and other Dances by the Shredded Wheat Pipe Band and Dancers which was expected to draw a large and appreciative crowd. Sports for the day included physical training display by school children; baby crawling races; boys firing water at each other in a modern form of a Roman Chariot race; girls walking on cold bricks and leaping over each other; ‘Centipedes’ race; empty pram racing; dogs on leads racing; bicycle racing among bottles and a motor cycle obstacle race. Those who own prams, dogs, cycles or babies were urged to enter. 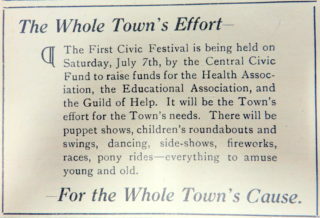 In addition, there were sideshows to ‘tempt all’ together with swings and roundabouts. 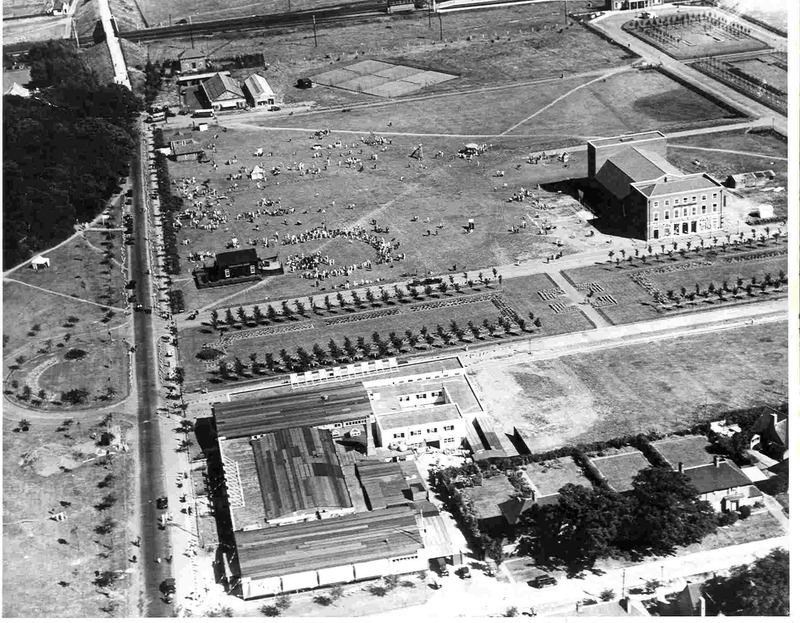 On the green (now the Campus) were ‘quiet sit down teas as a welcome interlude in a strenuous afternoon’. In the evening was a ‘Grand Special Evening Dance on the new floor of the New Pavilion at the Cherry Tree (now Waitrose) followed by fireworks. The day was filmed, which was shown in the Theatre the following week. There was also THURSTON’S Olde English Faire on the last three days ‘with roundabouts and all kinds of Fun’. Treasure Hunt, Special Gala Lunch at the Cherry Tree, Open Air Band Concert, Grand Variety Performance at the Theatre with Super Scenic Mannequin Parade on Stage. Staff Association Sports with brass band, Balloon Race, Community Singing, Dance in Marquee, Special Theatre programme. Thurston’s Fair, Spot the lucky assistant at the Stores, Festival lunch, Special St Albans afternoon, Masked Carnival, Community Singing. 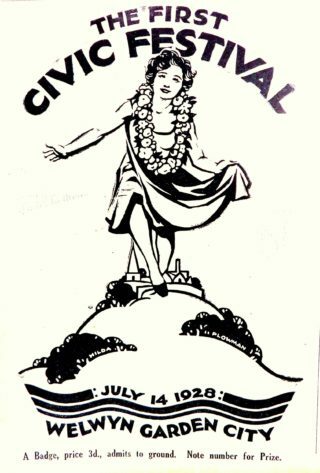 Remnant Day at the Stores, Al fresco band concerts all day, Grand Charity Ball with Cabaret in Giant Marquee, Wallace Beery, Raymond Harton and Monte Blue at the Theatre. Clearance Day at the Stores, Children’s Treasure Hunt, Grand Carnival, Special Family Entertainment at the Theatre. Note: Lt Col Henderson was a WW1 fighter pilot who was awarded the Military Cross and Air Force Cross for gallantry. After the war, he began Brooklands Flying School using a number of war surplus Avro 504 aircraft (one of which he brought to the Gala). 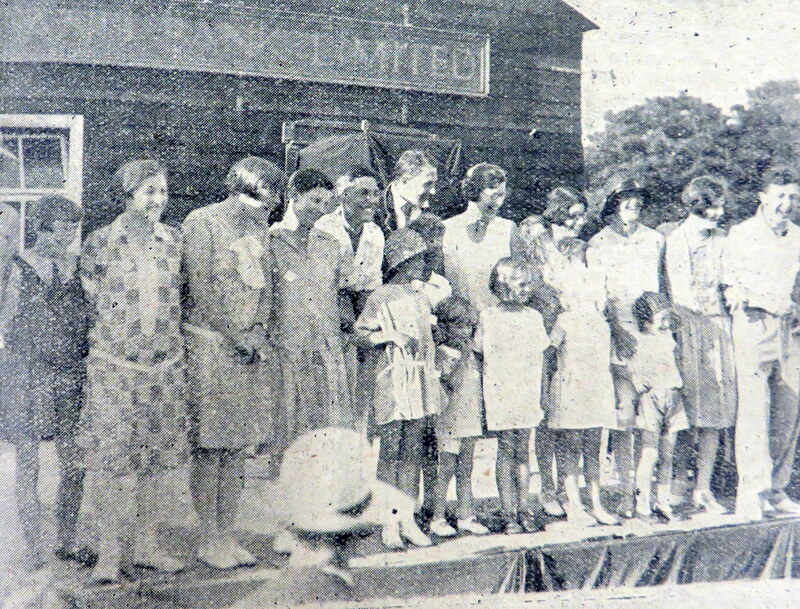 In 1930, Lt Col Henderson was killed in an air crash at Meopham, Kent. This page was added on 30/01/2015.